The concept of happiness can be multifaceted, with various areas of a woman's life contributing more to her happiness than others at any given time or life stage. As part of the POPSUGAR Insights "Find Your Happy" study, we surveyed women to track their agreement with a selected group of statements to gauge their overall happiness in key areas of their lives. 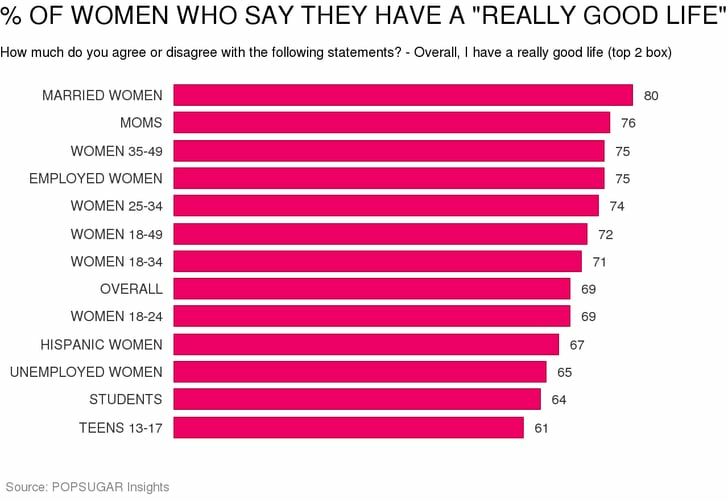 Overall, 69% of all women said that they have a really good life. This was true of individual segments, especially married women (80%), moms (76%), but was also shared by women aged 35-49 (75%), employed women (74%) and women 18-49 (72%) and women 18-34 (71%). Despite their overall happiness, there is a feeling among women that life could be better. Over 65% of women feel that they are more stressed than they should be, and only 54% of women think that they are as happy as they should be. The idea that life could be happier is a concept more likely to be shared by married women (61%), moms (59%), and working women (58%). Women also seek help in other areas of their life, as only 46% of women think they look as good as they can, 46% think they are as stylish as they could be, and 45% of women say they are as healthy as they should be. These happiness gaps represent opportunities for marketers to provide women with the information and confidence they need to improve the areas of their lives where they think they need the most help.